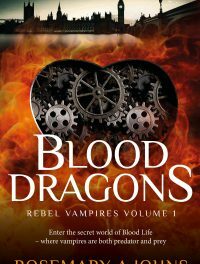 Blood Dragons is the first novel in the Rebel Vampires series from short-story author and playwright, Rosemary A. Johns. The book opens with Light, a rocker blood-lifer, living in rural England and Kathy, the love of his life, sinking slowly and inexorably into Dementia. The book takes the form of Light’s confession to Kathy, as he writes down his memories for her, leading to a very interesting narrative form. Between mentions of the present-day situation, Light tells of his election to blood-life at the hands of Ruby, his author and lover. The tale spans from 1866 to 1968 when, in the heart of London, Light finds Kathy, his Moon Girl. 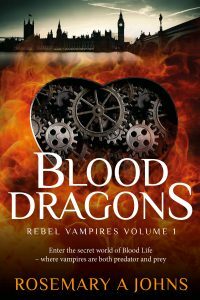 Rather than being fast-paced, this story takes its time to build up to an emotional climax that is very well done and is ultimately very satisfactory. My one complaint is that at times, the narrative voice is inconsistent. For the most part Light uses a lot of slang that I associate very much with England during the 50s and 60s but at points he uses words such as “fetid” which jarred in his voice. The large amount of slang used might make it a more difficult read for a wider audience but in the end, it would be worth their effort.